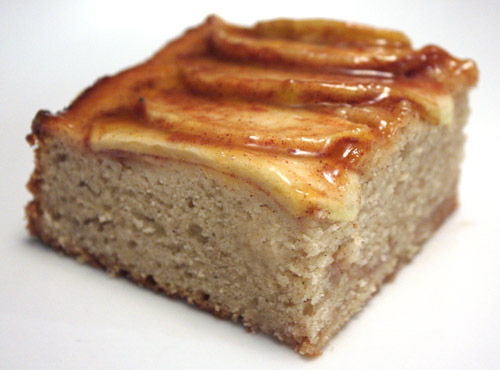 I love any apple cake and with cream cheese, it sounds amazing. I still have yet to bake from the Greyston Bakery book, and now I will have another baking book to drool over! A soft, moist and delicious cake! Marvelous! ooh Lisa, your cake looks absolutely divine!! I so love a moist apple cake! 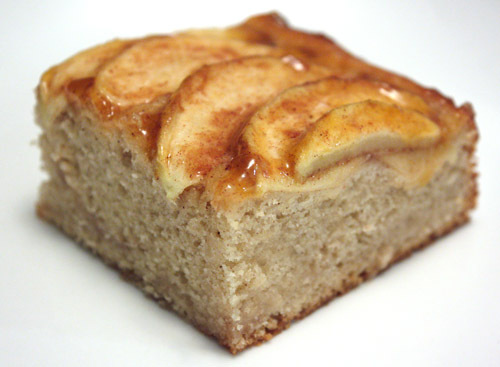 another apple cake for me to try, hooray! this one's pretty unique--i like the layer of apples up top, and i can tell that the cream cheese does a world of good for the crumb. it's cinnamon-happy, which makes me happy, and i think your impromptu glaze sounds perfect. I love cakes like this. Not overly complicated but with amazing ingredients. Great idea to brush the top with jam - you get that beautiful shiny top that looks so professional. This cake looks gorgeous! The top looks perfect. Oh Lisa, what a beautiful cake...absolutely gorgeous! Can you send me the recipe w/ the amounts of each ingredient? Or am I totally missing it? I don't actually re-print copyrighted recipes from books. I link to recipes when the original source is available online, and otherwise, I link to the books where the recipe is found. Mmmm.. this is a lovely cake, so delicious with apples! The cake itself looks so dense and moist! The apples are a nice touch layered on top. It's a beautiful cake! This sounds like a great book. Love the apples topping, very inviting! Nice to have potluck and dinner party to give us opportunities to bake as you say. This is a beauty...love all those apples on top! I never had this kind of cake before! This apple cake is truly gorgeous! What a lovely and original idea to use cream cheese in the batter. I definitely want to make something similar. If I had a plateful of this in front it me I'd gobble it all up too!! That looks so good Lisa! And I can see how this would have been perfect with whipped cream.. Such a moist looking cake! No doubt due to the cream cheese. 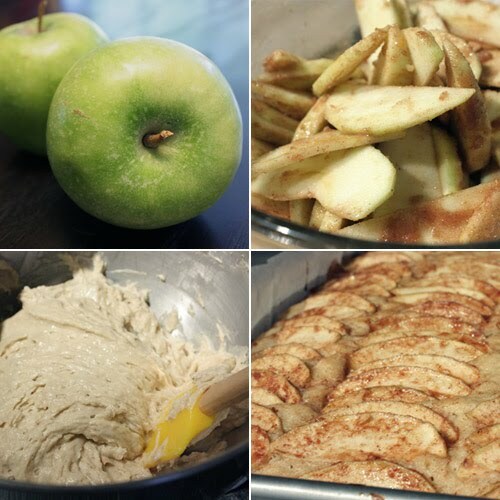 And those apples... you are a very talented baker. Such a fabulous looking cake! And its easy and delicious! I love your idea to put an apricot jam on top! 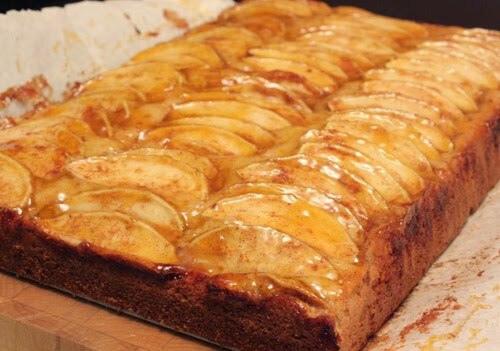 Your apple cake looks so pretty and delicious! pumpkin pie with top crust sounds good! I hope you make that soon. But you and I think alike... I would have zoomed in for the apple and cream cheese first! That cake looks sooooo good! Whipped cream or a glaze, I am sure it would great with either! The almond and the apples sound so good. I love the apples on the top. There's something irresistible about a cake or pie that features thin slices of apple arranged in this fashion on the top. Very pretty to look at and you just know it tastes good too. cream cheese and apples..wow! Lovely texture. I have always thought that there wasn't enough cream cheese IN baked goods. Lots of frosting but less cake. I cream cheese in rugelach because of the tenderness that it adds. I'm convinced that this cake tastes just as soft. And yes, vietnamese cinnamon is the real deal.